Join a vlogger on an expedition into a spooky haunted house to see whether monsters really do exist. 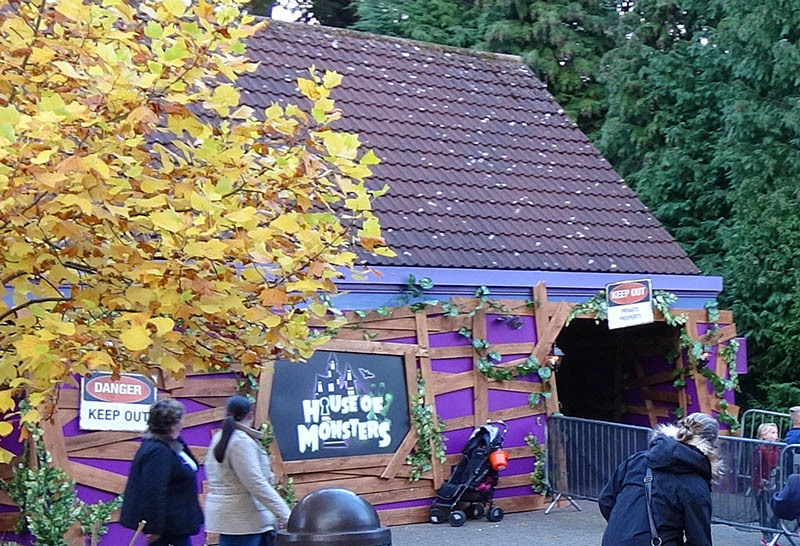 House of Monsters premiered at Scarefest 2016, and is Alton Towers' first ever scare maze targeted at a family audience. The maze's storyline has guests as a group of online followers who have come to help a vlogger explore a spooky abandoned house after he has become convinced that monsters are real and lurk inside. During the tour through the house, which lasts almost half an hour, guests encounter characters in different rooms and are set various interactive tasks before they can proceed to the next, all in an effort to free a guy called Frankie. The maze was updated for Scarefest 2018, with the second room modified to become the bedroom of a rockband-obsesssed teenage Vampire, and an extra room prior to Wolfboy's fashion show themed to a disgusting bathroom with new surfer dude monsters. House of Monsters is perfectly pitched toward its target audience - kids seem to love it and really get involved and it never crosses the line from fun to scary. However, it hits the mark for a wider age range too, with pantomime-like humour and engaging actors to please adults in the group as well. It may be Alton's first attempt at a family scare maze, but it is already a triumph.